Like most cities, the primary mode of transportation in the Bismarck-Mandan area is that of the automobile. For many decades, however, the passenger locomotive was the main way in or out of the city. A trolley system also once existed in Bismarck, connecting downtown with the capital. Transportation via train is still very common for cargo, however passenger service was discontinued some time ago. The newly expanded Bismarck Airport is the largest airport terminal for western North Dakota. Delta Airlines is the largest provider, however United, Frontier, and Allegiant Airlines also serve Bismarck. Established in 2004, Capital Area Transit (CAT) serves as the public busing system, and Bis-Man Transit provides door-to-door transportation to senior citizens and the disabled. Most Bismarck streets form a standard block grid, with northbound and eastbound roads. Typically northbound roads are numbered “streets”, such as 9th Street, and eastbound roads are named “avenues”, such as Divide Avenue. Addresses are based off their location to Washington Street and Main Avenue. Addresses north of Main Avenue are labeled as “north” and vise-versa for addresses located south. Addresses east of Washington are labeled “east” and vise-versa. The address numbering system is also based on the building locations in reference to these two streets. There are several one-way roads throughout Bismarck. 7th & 9th Streets are the most notable one-ways in the city, running between Boulevard Avenue to Bismarck Expressway. Several important structures are located along these two streets, including Kirkwood Mall and Bismarck High School. Broadway/Thayer Avenues and 4th/5th streets also operate as one-ways for two blocks in downtown Bismarck. Two major highways bisect Bismarck. I-94 runs eastbound through northern Bismarck, and US-83, known more commonly as State Street, connects to Minot, North Dakota and is also a main route to Lake Sakakawea, the largest lake in North Dakota. The State Street Corridor, near where I-94 and US-83 bisect, is home to one of Bismarck’s main retail hubs. Prior to the completion of the interstate in 1965, US-10 was the major highway running through the heart of Bismarck, along Main Avenue. The Liberty Memorial Bridge serviced US-10 traffic and was the first vehicular bridge to connect Bismarck and Mandan when completed in 1922. 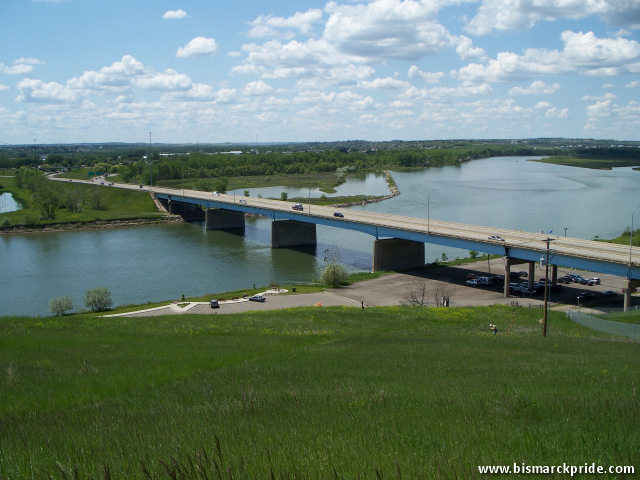 Today, there are three vehicular bridges spanning the Missouri River in Bismarck-Mandan. Even today, city engineers continue to favor standard grid-style streets over modernized approaches, such as cul-de-sacs. One major reason for this is the easy and efficiency to clean and maintain the streets, especially in snow removal. Bismarck has laid out a snow emergency route throughout the city. This route marks the first streets to be cleaned in a snow emergency. They often are the major roads, or located near a public institution such as a school or hospital. Vehicles are not allowed to park on these streets during snow emergencies and will be towed. You have to watch out for Bismarck drivers, who, as a whole, are notoriously known for their bad driving behaviors. In 2008, Bismarck had the highest accidents per capita out of any other major city in North Dakota, with 34 crashes per 1,000 people. In comparison, the second ranked city, Minot, only had 26.7 crashes per 1,000 people. Burleigh County also had more accidents per capita out of the North Dakota counties, with 4.28 crashes per million vehicles, as opposed to second place’s 3.01 crashes. Failure to properly yield and excessive speeds are common occurrences within the city, and often cited as the reasons for crashes. Bismarck’s so-called “red light runners” are a frequent complaint amongst most citizens. Non-controlled residential streets and parking lots are especially dangerous. As you can imagine, if drivers are already running red lights, they are not likely to yield right of way at an uncontrolled intersection. Bismarck’s infamous winter weather can be a major nuisance on the streets, often contributing to crashes during the winter months. The City of Bismarck is often criticized for its treatment of snow and ice on the streets, but careless driving is indeed the most common reason for crashes on slick roads.